LHS occurs predominantly among middle-aged adults with a mean onset at 50 years of age and occurrence is usually seen after puberty. It is more prevalent in women and most reported cases have been in Whites, particularly in French and Italians. , Reported cases have varied between second and ninth decades of life. ,,,,, We made an attempt to review LHS which is less popular in the field of dental health professionals. A MEDLINE/PubMed search of the literature on LHS published in the last four decades has been made based on the key word Laugier-Hunziker syndrome, idiopathic lenticular mucocutaneous pigmentation. The articles pertaining to case reports, differential diagnosis, and treatment modalities in english language literature were evaluated and studied. The articles in different languages which provided english language abstract were also reviewed. Our search yielded 172 case reports published till date. Details pertaining to these case reports are methodically tabulated [Table 1]. LHS is a diagnosis of exclusion. Solitary and multiple macules of the oral mucosa are associated with various causes. Solitary macules of oral mucosa are less common. Multiple labial macules are more likely to have association with a variety of syndromes. , Dentist, as a health care professional, should carefully rule out all the differential diagnoses associated with hyperpigmentation before diagnosing LHS [Table 2]. Various differential diagnoses considered for LHS can be ruled out by the appearance and the etiology for hyperpigmentation. Drug-induced pigmentation will usually occur after months or years of chronic use of drugs and tends to resolve once the drug is discontinued. AIDS patients show hyperpigmentation secondary to the drugs taken [Table 2]. Smoking could result in oral mucosal pigmentation called smoker's melanosis and it is predominantly seen in anterior gingiva. In addition, smoking is not associated with pigmentation of the nails. Physiologic (racial) pigmentation of the oral mucosa is seen in Asians, Blacks, and other dark-skinned persons, resembling LHS. Racial pigmentation is most commonly demonstrated in the gingiva although it may be found in any location. Addison's disease is an endocrine disease marked by insufficient production of cortisol and aldosterone by the adrenal glands. It is characterized by hyperpigmentation of the skin and mucosal membranes, associated with increased level of circulating adrenocorticotropic hormone (ACTH). Bandler syndrome is a rare genodermatosis that presents with hyperpigmented macules in the hands, nails, and oral mucosa during infancy, as well as intestinal vascular malformation that can cause significant gastrointestinal bleeding. Mc Cunnie Albright syndrome exhibits labial and genital pigmentation, but it is often unilateral and does not involve the nails. The disease is also accompanied by precocious puberty in females and fibrous dysplasia. Although the condition has been recognized and several case reports have been published, it is still unknown to many oral pathologists, general dentists, and other oral health care providers. Most text books on oral pathology and oral medicine do not include LHS as a cause of oral pigmentation probably because of its benign nature and innocuous course. As Mignogna et al. pointed out, it is likely that the syndrome is more common than the reported cases. The appearance of new areas of pigmentation on mucus membrane in a middle-aged patient may be considered quite alarming. Therefore, it is important that clinicians be made aware of this benign condition as a cause of multifocal pigmentation of the oral mucosa and lips. The importance of recognizing LHS is to avoid unnecessary investigations and treatment. LHS should be added to the list of conditions in which mucosal and ungual hyperpigmentation is seen without a significant risk of malignant development. 1. Siponen M, Salo T. Idiopathic lenticular mucocutaneous pigmentation (Laugier-Hunziker syndrome): A report of a case. Oral Surg Oral Med Oral Pathol Oral Radiol Endod 2003;96:288-92. 2. Lamey PJ, Nolan A, Thomson E, Lewis MA, Rademaker M. Oral presentation of the Laugier-Hunziker syndrome. Br Dent J 1991;171:59-60. 3. Baran R, Barrière H. Longitudinal melanonychia with spreading pigmentation in Laugier-Hunziker syndrome: A report of two cases. Br J Dermatol 1986;115:707-10. 4. Pereira PM, Rodrigues CA, Lima LL, Reyes SA, Mariano AV. Do you know this syndrome? An Bras Dermatol 2010;85:751-3. 5. Jabbari A, Gonzalez ME, Franks AG Jr, Sanchez M. Laugier Hunziker syndrome. Dermatol Online J 2010;16:23. 6. Moore RT, Chae KA, Rhodes AR. Laugier and Hunziker pigmentation: A lentiginous proliferation of melanocytes. J Am Acad Dermatol 2004;50(5 Suppl):S70-4. 7. Ayoub N, Barete S, Bouaziz JD, Le Pelletier F, Frances C. Additional conjunctival and penile pigmentation in Laugier- Hunziker syndrome: A report of two cases. Int J Dermatol 2004;43:571-4. 8. Makhoul EN, Ayoub NM, Helou JF, Abadjian GA. Familial Laugier-Hunziker syndrome. J Am Acad Dermatol 2003;49(2 Suppl Case Reports):S143-5. 9. Sabesan T, Ramchandani PL, Peters WJ. Laugier-Hunziker syndrome: A rare cause of mucocutaneous pigmentation. Br J Oral Maxillofac Surg 2006;44:320-1. 10. Mignogna MD, Lo Muzio L, Ruoppo E, Errico M, Amato M, Satriano RA. Oral manifestations of idiopathic lenticular mucocutaneous pigmentation (Laugier-Hunziker syndrome): A clinical, histopathological and ultrastructural review of 12 cases. Oral Dis 1999;5:80-6. 11. Gerbig AW, Hunziker T. Idiopathic lenticular mucocutaneous pigmentation or Laugier-Hunziker syndrome with atypical features. Arch Dermatol 1996;132:844-5. 12. Seoane Lestón JM, Vázquez García J, Cazenave Jiménez AM, de la Cruz Mera A, Aguado Santos A. Laugier-Hunziker syndrome. A clinical and anatomopathologic study. Presentation of 13 cases. Rev Stomatol Chir Maxillofac 1998;99:44-8. 13. Yamamoto O, Yoshinaga K, Asahi M, Murata I. A Laugier- Hunziker syndrome associated with esophageal melanocytosis. Dermatology 1999;199:162-4. 14. Ferreira MJ, Ferreira AM, Soares AP, Rodrigues JC. Laugier-Hunziker syndrome: Case report and treatment with the Q-switched Nd-Yag laser. J Eur Acad Dermatol Venereol 1999;12:171-3. 15. Kanwar AJ, Kaur S, Kaur C, Thami GP. Laugier-Hunziker syndrome. J Dermatol 2001;28:54-7. 16. Papadavid E, Walker NP. Q-switched Alexandrite laser in the treatment of pigmented macules in Laugier-Hunziker syndrome. J Eur Acad Dermatol Venereol 2001;15:468-9. 17. Lenane P, Sullivan DO, Keane CO, Loughlint SO. The Laugier-Hunziker syndrome. J Eur Acad Dermatol Venereol 2001;15:574- 7. 18. Lampe AK, Hampton PJ, Woodford-Richens K, Tomlinson I, Lawrence CM, Douglas FS. Laugier-Hunziker syndrome: An important differential diagnosis for Peutz-Jeghers syndrome. J Med Genet 2003;40:e77. 19. Aytekin S, Alp S. Laugier-Hunziker syndrome associated with actinic lichen planus. J Eur Acad Dermatol Venereol 2004;18:221-3. 20. Akcali C, Serarslan G, Atik E. The Laugier-Hunziker syndrome. East Afr Med J 2004;81:544-5. 21. Ozawa T, Fujiwara M, Harada T, Muraoka M, Ishii M. Q-switched alexandrite laser therapy for pigmentation of the lips owing to Laugier-Hunziker syndrome. Dermatol Surg 2005;31:709-12. 22. Sardana K, Mishra D, Garg V. Laugier Hunziker syndrome. Indian Pediatr 2006;43:998-1000. 23. Gencoglan G, Gerceker-Turk B, Kilinc-Karaarslan I, Akalin T, Ozdemir F. Dermoscopic findings in Laugier-Hunziker syndrome. Arch Dermatol 2007;143:631-3. 24. Yago K, Tanaka Y, Asanami S. Laugier-Hunziker-Baran syndrome. 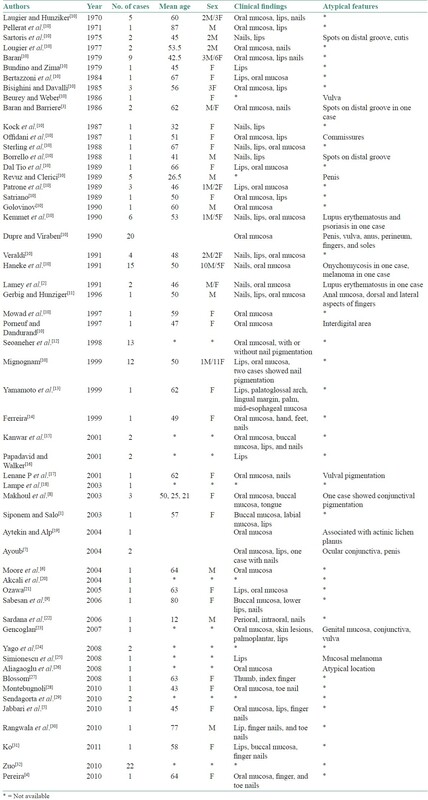 Oral Surg Oral Med Oral Pathol Oral Radiol Endod 2008;106:e20-5. 25. Simionescu O, Dumitrescu D, Costache M, Blum A. Dermatoscopy of an invasive melanoma on the upper lip shows possible association with Laugier-Hunziker syndrome. J Am Acad Dermatol 2008;59(5 Suppl):S105-8. 26. Aliagaoglu C, Yanik ME, Albayrak H, Güvenç SC, Yildirim U. Laugier-Hunziker syndrome: Diffuse large hyperpigmentation on atypical localization. J Dermatol 2008;35:806-7. 27. Blossom J, Altmayer S, Jones DM, Slominski A, Carlson JA. Volar melanotic macules in a gardener: A case report and review of the literature. Am J Dermatopathol 2008;30:612-9. 28. Montebugnoli L, Grelli I, Cervellati F, Misciali C, Raone B. Laugier-hunziker syndrome: An uncommon cause of oral pigmentation and a review of the literature. Int J Dent 2010;2010:525404. 29. Sendagorta E, Feito M, Ramírez P, Gonzalez-Beato M, Saida T, Pizarro A. Dermoscopic findings and histological correlation of the acral volar pigmented maculae in Laugier-Hunziker syndrome. J Dermatol 2010;37:980-4. 30. Rangwala S, Doherty CB, Katta R. Laugier-Hunziker syndrome: A case report and review of the literature. Dermatol Online J 2010;16:9. 31. Ko JH, Shih YC, Chiu CS, Chuang YH. Dermoscopic features in Laugier-Hunziker syndrome. J Dermatol 2011;38:87-90. 32. 32 Zuo YG, Ma DL, Jin HZ, Liu YH, Wang HW, Sun QN. Treatment of Laugier-Hunziker syndrome with the Q-switched alexandrite laser in 22 Chinese patients. Arch Dermatol Res 2010;302:125-30. 33. Bork, Hoede, Korting, Burgdorf, Young. 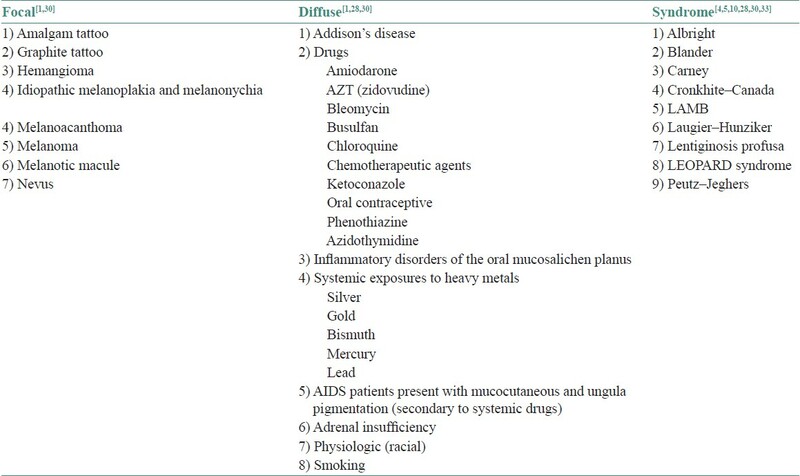 Disease of oral mucosa and lips. Chapter-Benign tumors. Philadelphia, PA: WB Saunders Company; 1996. p. 311.